If the layout of your landing page is very generic and simple, it won’t entice users to click. 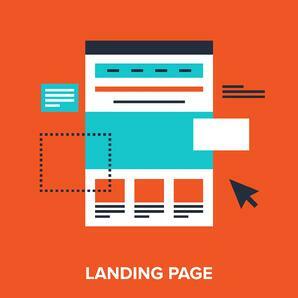 Remember, the purpose of a landing page is to convince a visitor to contact you. Landing pages therefore must contain a compelling reason to fill out the form. For this reason, it’s important to have an eye-catching, enticing layout. However, don’t go crazy on your design. An overly busy design will distract visitors from filling out the form. For this reason, you should choose a simple but attractive layout to entice users. When you create a form, it’s often temping to include as many fields as possible to collect the most possible information. However, when forms are too long, people will often abandon them, unable to focus for that long or unwilling to provide too much personal information. An ideal form includes a name, a means of contact, a location, and possibly one or two important questions that will help you segment your lists. When forms go beyond this length, they will deter visitors from filling them out, lowering the amount of leads you capture and your conversion rates. There are few things more frustrating to a lead than coming across a landing page and having no clue what to do next. Unfortunately, a lot of businesses make the mistake of trying to stuff their landing page with too much information. Though their intentions are good, conversion rates will suffer if you do this. On the other hand, if you offer too little information on your landing page, it can be just as confusing-- the user won't understand what they're getting. So, make sure the directions on your landing page are obvious, and be sure to include any important information that tells leads what they will be getting by filling out the form. Most people discuss the buyer’s journey in the context of lead nurturing and content creation, but it applies to your landing page as well. When people visit your landing page, they will have different needs. It’s important to cater the content, visuals, and layout to the needs of the people who are visiting your landing page. For this reason, you must consider the stage of the buyer’s journey your typical visitor will be at when you create your landing page. If your landing page offers a free quote, you won’t want to tailor your landing page to someone who’s just begun doing their research. Considering the context in which the visitor ends up on your landing page to maximize your conversion rates. The overall quality of your landing page copy goes well beyond the grammar and spelling. Your writing needs to quickly communicate certain things to a site visitor. Your copy should communicate that you understand the visitor’s problem; that you have a solution that could be used to solve their problem; that they just need to take the following step to get closer to their solution. If a visitor fails out at any of these checkpoints, they are going to bounce before they go any further. Does your business need help working on your marketing strategy? Our professional copywriters blend sales-motivating copy with search-engine optimized (SEO) keywords and phrases to ensure your website will be found on the web — and then motivate your customers to take action. Our team takes pride in driving all of our clients campaigns to their highest potential allowing them to leave a dominant digital footprint. Is your Content Marketing strategy ready to go? If you have any questions, we love a good conversation!